Essential Nutrients Omega 3 Oils - Why You Can't Live Without? Essential nutrients omega 3 oils are good fats. Artificially produced trans-fatty acids are bad fats. Essential Our body cannot produce omega 3 oils but need them to live. They are also called essential fatty acids (EFA). Essential fatty acids are polyunsaturated and grouped into two families, the omega-3 EFAs and the omega-6 EFAs. Studies has shown that our bodies function best when the ratio of omega 6 EFA and omega 3 is 6:1. However, recent studies have shown that typical American diet has a omega 6 to omega 3 ratio of as high as 20:1. There is a rising need among the American to reap the benefits of essential nutrients omega 3 oils and stay on course to maintain healthy body. Supplementing your diet with essential omega 3 oils supplement is now important and crucial as the natural sources of omega 3 oils may not be accessible you. The main sources of omega-6 fatty acids are vegetable oils such as corn oil and soy oil that contain a high proportion of linoleic acid. Omega-3 acids are found in flaxseed oil, walnut oil, and marine plankton and fatty fish. Flaxseed and walnut oils are contain high alpha-linolenic acid (ALA) while fatty fish’s oil has high content of eicosapentaenoic acid (EPA) and docosahexaenoic acid (DHA). Scientists discovered the benefits of EPA and DHA in the early 1970s when Danish physicians studied that Greenland Eskimos had an exceptionally low incidence of heart disease and arthritis despite the fact that they consumed a high-fat diet. Researchers soon discovered that two of the fats (oils) they consumed in large quantities, EPA and DHA, were actually highly beneficial. More recent research has established that fish oils (EPA and DHA) can help in prevention of atherosclerosis, heart attack, depression, and cancer. Knowing the benefits of EPA and DHA and the serious consequences of a deficiency the US National Institutes of Health recentlypublished Recommended Daily Intakes of fatty acids. Researches, scientists and doctors are discovering more benefits of essential nutrients omega 3. Supplementing with fish oils has been found to be entirely safe even for periods as long as 7 years and no significant adverse effects have been reported in hundreds of clinical trials using as much as 18 grams/day of fish oils. Fish oil supplementation does, however, lower blood concentrations of vitamin E so it is a good idea to take extra vitamin E when adding fish oils to your diet. A clinical trial carried out by the US Department of Agriculture found that taking 200 mg/day of synthetic vitamin E (equivalent to about 100 IU of natural alpha-tocopherol) is sufficient to completely counteract this effect of fish oil supplementation. Cod liver oils differ from fish oils. Cod liver oil is extracted from cod liver. Cod liver oil has high content of vitamins A and D. Fish oils are extracted from the tissues (flesh) of fatty fish like salmon and herring and are good sources of EPA and DHA. Fish oils contain very little vitamin A and D, but cod liver oil does contain EPA and DHA. However, trying to obtain therapeutic amounts of EPA and DHA from cod liver oil may end you up with vitamins A toxicity. While choosing between flaxseed oil or fish oil for your EPA and DHA supplementation, a few factors need to be considered. Our body can convert Alpha-linolenic acid (ALA) to EPA and DHA. However, the conversion efficiency varies from person to person. Low conversion efficiency happens especially to older people. If you prefer fish oil, I recommend that you choose high grade of fish oil over the cheap ones. There is a concern over mercury contamination in fish oil harvested from the ocean. GMP manufacturer tends to produce high quality fish oil free from mercury, pesticides and other contaminants. Xtend-Life if one of such GMP Manufacturer that produce such high quality fish oil. read the Online Vitamin review here. 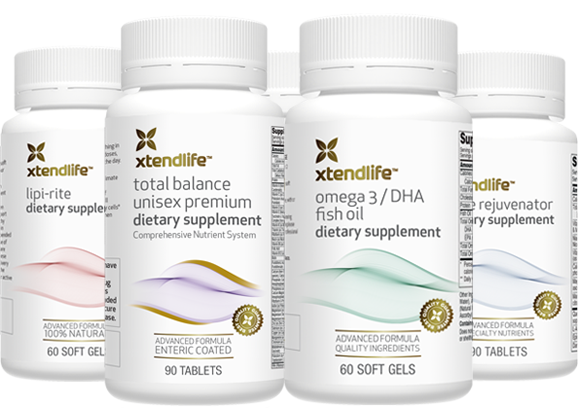 To go to Xtend-Life Omega 3 supplement here. Where You Can Find Quality Essential Nutrients Omega 3 Oils? High quality omega 3 oils are stabilized with adequate amounts of vitamin E and are packaged in individual foil pouches or other packaging impervious to light and oxygen. This will prevent the omega 3 oil from turning rancid. Return to page top of essentail nutrients omega 3 oils page. End of Essential Nutrients Omega 3 Page.